ONLY UK HARPLOCK SUPPLIER- HONKIN' TOM IS FULL OF GREAT IDEAS! Play hands-free without a rack around your neck. Use one mic for vocals and harp. HarpLock-Magnetic uses a single rubber covered magnet to hold your harmonica safely and securely at the grill of a microphone. HarpLock provides fast, secure harmonica changes and allows the use of a single microphone to capture both vocals and harp. Traditional neck worn harmonica holder's tend to slip and move in use. If the harmonica is moving, it's more difficult to play. With HarpLock, the harmonica is held securely at the grill of the microphone. When the harp stays put you naturally play better. HarpLock is completely nondestructive, easily removable and guaranteed for life. To better understand how HarpLock functions take a look at the photos or watch the video available at our website. HarpLock is mounted between the grill and the base of a Shure SM 58 microphone and should always be used with a sturdy mic stand. (The "DR Pro" tripod works great.) HarpLock is made of rigid stainless steel and is available in two versions. HarpLock- LS and HarpLock-Magnetic. HarpLock-Magnetic (shown here) is the newest version and uses a single rubber covered neodymium magnet to hold your harmonicas securely in place. (Your harp stays put, and it doesn't get scratched) Slip on the HarpLock, set your harmonica in the unit, then throw out that mess you used to wear around your neck. It works, its solid, it's guaranteed for life. 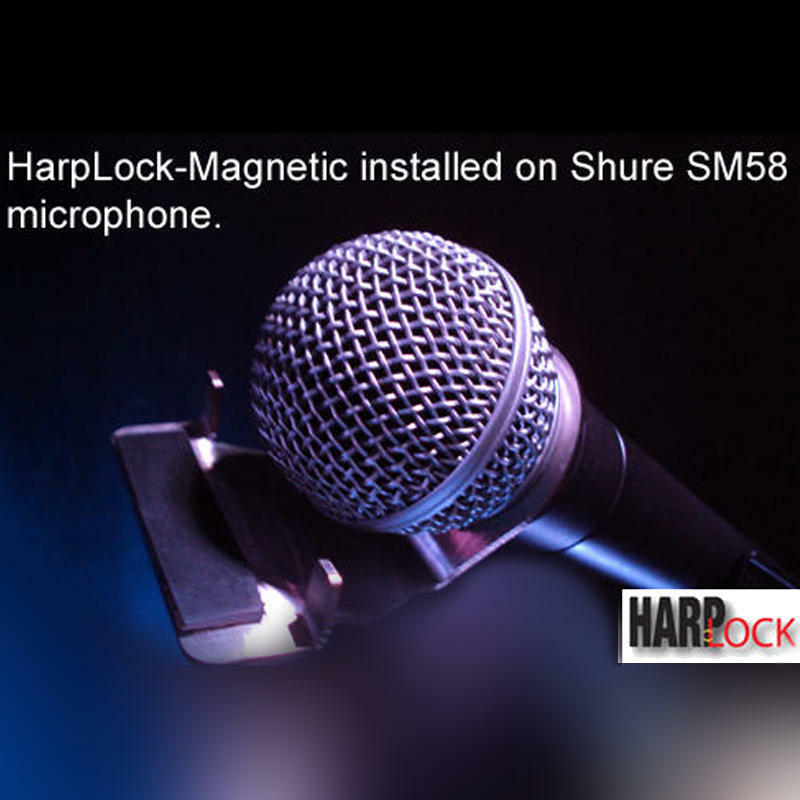 HarpLock-Magnetic is designed and recommended for the Shure SM58 or similar shaped microphones.